Home News Top Global Searches Trending The 2015 Perseid meteor shower will peak on August 11, 12 and 13. The 2015 Perseid meteor shower will peak on August 11, 12 and 13. Perseids as one of the best star showers of 2015. This year’s Perseid meteor shower will reach its peak on Wednesday and Thursday this week. And because of a lucky coincidence this time around, eyes on the skies are sure to be dazzled. “The Perseids feature fast and bright meteors that frequently leave trains,” reads the U.S. National Aeronautics and Space Administration (NASA) assessment, pointing to the Perseids as one of the best star showers of 2015 alongside December’s Geminids. The count is expected to reach an impressive frequency of 60-100 per hour this week, NASA reports., with velocities expected to be as fast as 37 miles (59 kilometers) per second. The name of the star shower comes from the Perseus constellation, from whence the celestial show appears to radiate. The meteors will always travel in a path away from the constellation for which the shower is named. This apparent point of origin is called the "radiant." For example, meteors during a Leonid meteor shower will appear to originate from the constellation Leo. (Note: the constellation only serves as a helpful guide in the night's sky. The constellation is not the actual source of the meteors. What makes this year so special? The Perseids' peak this year coincides with a new moon, making the sky as dark as it gets, and therefore, making the meteors' lights more visible for us here on Earth. When Can I See the Perseids? 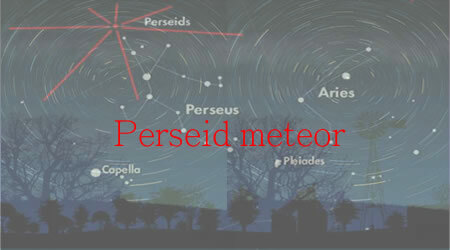 According to Time and Date the Perseid meteor shower, one of the brighter meteor showers of the year, occur every year between July 17 and August 24. The shower tends to peak around August 9-13. The best time to view the Perseids, or most other meteor showers is when the sky is the darkest. Most astronomers suggest that depending on the Moon’s phase, the best time to view meteor showers is right before dawn. How to enjoy Perseid fullest glory? First needs to be situated in the Northern Hemisphere. In order to avoid “light noise,” the best option is to travel somewhere outside of the city, preferably to wilderness, where the sky will be ideally dark for watching the spectacular meteor show overhead. Facing northeast will guarantee the ultimate experience, as Perseus is seen from the Earth in this cardinal direction this time of year. Check the weather: Meteors, or shooting stars, are easy to spot, all you need is clear skies and a pair of eyes. Prepare to wait: Bring something to sit or lie down on. Star gazing is a waiting game, so get comfortable. Notes: A thin crescent moon sets early enough to allow for favorable viewing from midnight to dawn. Lyrid meteors often produce luminous dust trains observable for several seconds. Notes: Given the shower's broad peak, you may catch a few Eta Aquariids on the days before and after May 6. Most activity will be visible in the Southern Hemisphere, though that old devil moon may obscure viewing. Notes: This small show is a no-show in 2015. Expect light interference from the waxing gibbous moon. Notes: If you see one meteor shower this year, make it August's Perseids or December's Geminids. The Perseids feature fast and bright meteors that frequently leave trains, and in 2015 there will be no moonlight to upstage the shower. Notes: The Orionids, formed from the debris of Halley's comet, are known for being bright and quick. Best viewing will be pre-dawn. Notes: The Leonids are usually a modest shower, with the peak occurring in the dark hours before dawn. The waning crescent moon should leave skies dark enough for a decent show. Notes: The Geminids are typically one of the best and most reliable of the annual meteor showers. It’s one of the best opportunities for younger viewers who don't stay up late, because it gets going around 9 or 10 p.m. local time. Expect delightfully dark skies this year; the thin crescent moon sets early.